When I first started in online marketing I stayed far away from any conversion strategy that had to do with website pop-ups. Why, you ask? Because I hated them and I found them very intrusive. I thought they would reflect negatively on my brand, annoy my website visitors, and might be mistaken as spam. But, one day I decided to be more open to trying new things on my website, after all change is good, right? So, I decided to try out pop-ups, no matter how much I dreaded it, convinced that everyone hated them as much as me. The result: I was surprised, ashamed, and excited. Yes, all those emotions happened. I was surprised at how good the results were, I was ashamed that I was so against them at the beginning, and I was excited because I wanted to keep testing them out on my website to increase conversion results. You’re probably in the same boat I was on when I first started experimenting with pop-ups, which is why you’re here because you’re trying learn more about them. Well, you’ve started on the right foot because you’ve ended up on the right article. I’ll go over the basics—what are website pop-ups, take you through some Do’s and Don’ts of website pop-ups, and leave you with some inspiring website pop-ups you can try on your website too! And if you still have some questions, leave them them in the comments below. A pop-up is when a new window browser automatically opens in front of the main browser without any action from the visitor. A pop-in is similar to a pop-up in that it displays content in front of the main browser. However, a pop-in opens a box within the page rather than a new window. Make sure to make it visibly clear where your visitors can close a pop-up. If you don’t make this easy the user experience for your website visitors will lessen, therefore increasing bounce rates and decrease conversions. Just like email marketing best practices, the content you provide new visitors and regulars should be different. Segment your new visitors and return visitors so you can serve each of these segments different content and offers to improve conversions. Segment your website visitors beyond new vs return visitors and add an additional layer by taking the number of visits and pages a person makes on your website. If a visitor has continuously gone back and forth from a product page to a check-out page, however, never completed the check-out process, use a pop-up to guide them in the right direction. Try to limit the number of pop-ups you display on your website to avoid being indexed as spam. 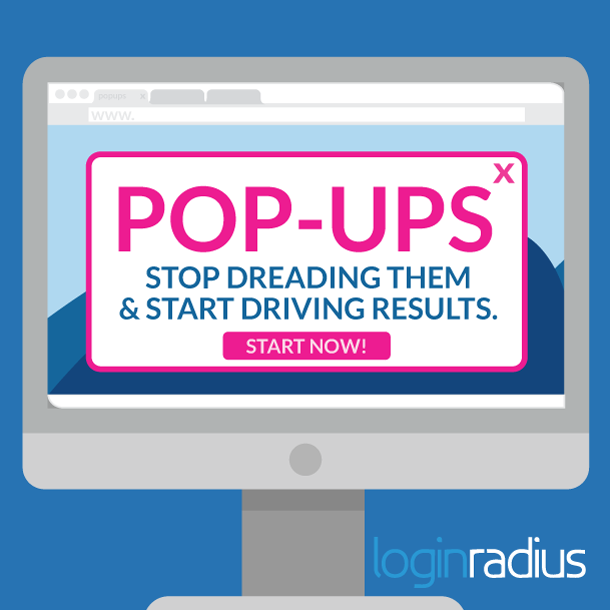 Be strategic with your pop-ups usage so that you can ensure you’re providing your website visitors with an ideal user experience while supporting your conversion strategy. Setting up parameters such as when your pop-up should be displayed provides your website visitors time to gain some knowledge about what your website is about. The 1 to 2 mins wait before a pop-up provides your visitors enough context so that when it does appear they don’t feel overwhelmed and confused by the messaging. Your website visitor probably already dislikes the fact that you’ve interrupted them while they were shopping or reading a blog post, so to make sure you achieve your conversion goals, keep your ‘ask’ simple. If you want people to subscribe to your blog, just ask for their email address. If you want them to download an ebook, a name and email address should be enough. There are definitely many best practices and we only highlighted some in the list above. But, if you feel there is a best practice that must be included in our list, let us know in the comments at the end of the post. This pop-up is successful because they only target one traffic source, Facebook. It’s unique to its traffic source, and with its tailored messaging they are then able to increase conversion. The ask is simple, to “like” the Mashable Facebook Page, and they make it easy with a Facebook Like button up-front and ready to go. They also use their brand tagline and provide social proof to reinforce why their website visitor should like their Facebook Page. However, the problem with this pop-up is that they don’t segment their website visitors. The pop-up shows up even if you’ve already liked their Facebook Page. Copyhackers is a copywriting and conversion rate optimization business and blog that provides its visitors assistance in writing more persuasive and believable copy, to boost email and increase conversion rates. This is a pop you get when you go to their blog, however, it’s not your typical pop-up, it shows up on the bottom left corner of the window. You can tell immediately that goal of this pop-up is to increase downloads of their new 2015 Persuasion Guide. 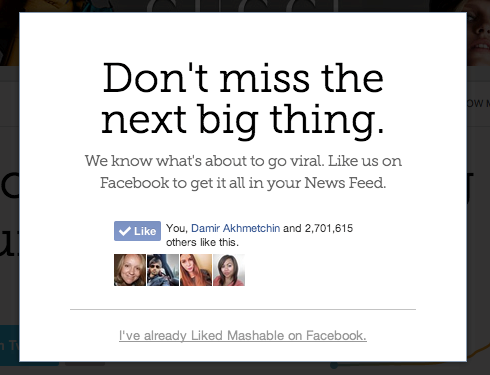 What I like about this one is that it’s not intrusive, you get to choose whether or not you want to see the pop-up. If you do decide to click on the bottom left pop-up this shows up and continues the visitors journey to downloading their guide. 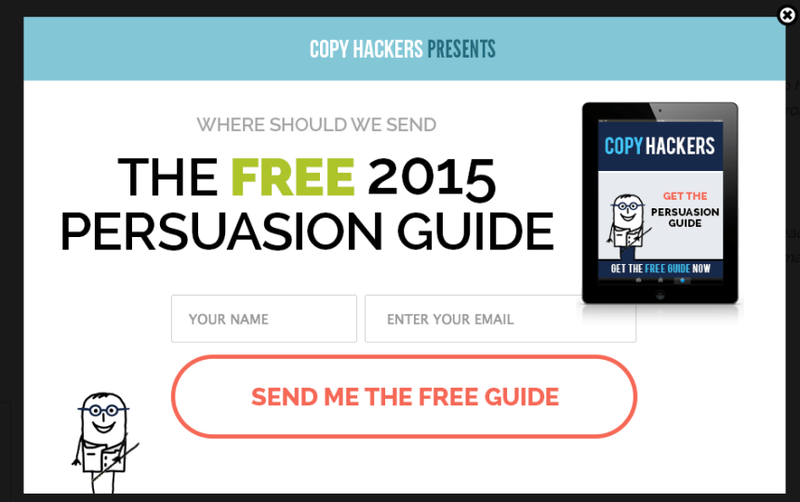 The ask is simple, “Where should we send The Free 2015 Persuasion Guide.” Since you clicked on the pop-up, it makes the assumption that you want it, which is why the ask aligns back to the action the visitor took. Allowing the visitor to be the one in charge of the pop-up and not the website. I also like how the pop-up doesn’t show up until you scroll down, which notifies the website that this visitor is actually interested in the content being presented and is more likely to download a guide. 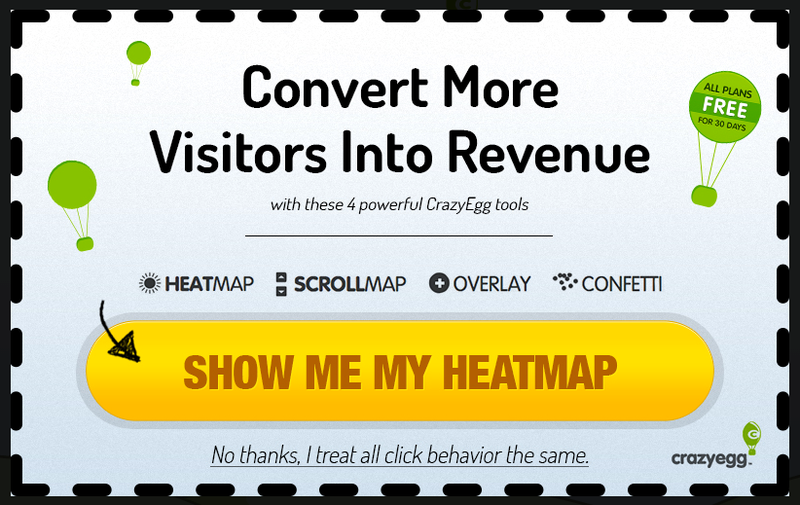 This is a good way to qualify your website visitors to increase conversion. They’ve kept it simple by just asking only for your email address to subscribe to their newsletter. 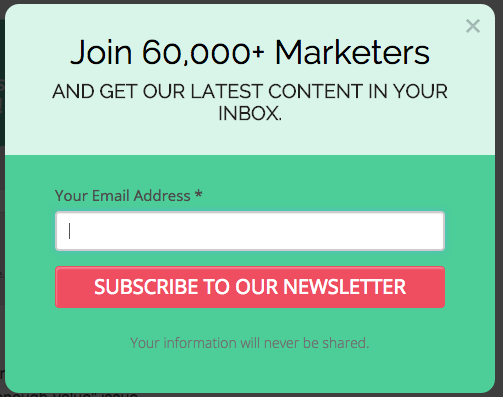 I like how they provide proof that there’s over 60,000 marketers who have already subscribed. Now, wouldn’t you want to make sure that you’re also subscribed so that you’re not missing out on what other marketers like you are also reading about? I also like how they included a disclaimer about how your information will never be shared. This really gives you a piece of mind that subscribing for their newsletter isn’t all that bad. What I like about this website pop-up is that it provides the value right in their headline. 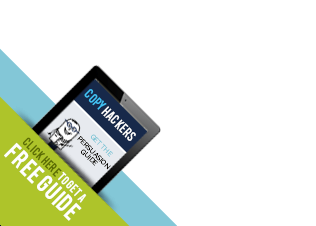 Who wouldn’t want to convert website visitors into revenue? The ask is so simple that all you need to do is click the big yellow button that takes you to your heatmap. But, it also gives you the option to reject the offer. The statement that triggers the rejection of the offer is using a form of persuasion copywriting that doesn’t make you feel bad but makes you rethink your decision. I can’t deny that website pop-ups are intrusive and that they can be annoying, however, they can produce some surprising results. You still may not be sold on trying them on your website. Depending on how you use them, they can either work for the good of your conversion strategy, or for the worst. All you need to do is try them out, test, review, and test again! Have you tried using website pop-ups? What were your experiences with them? We’d love to hear in the comments below.